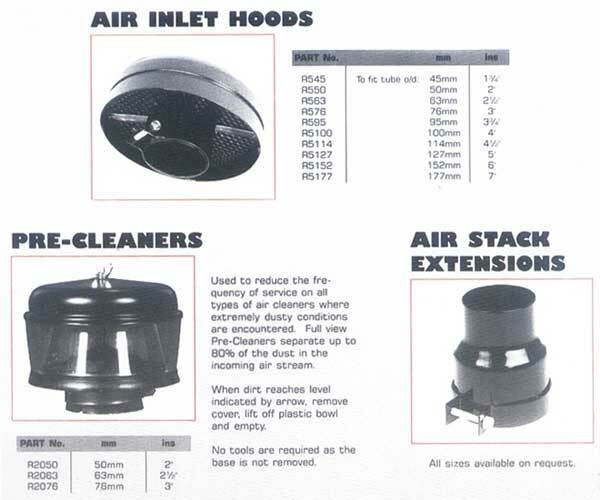 The ROVOS air cleaner offers excellent air cleaning efficiency of 99.9% at 5um, low maintenance requirements, "back-up" safety and ease of mounting... in a economical air cleaning system. Low initial restriction, wide range of air flow capacities, compactness, light weight, and operating capability under severe dust conditions or where moisture is a constant hazard, offers versatility for a wide range of applications. p to three times by using professional washing ervice. 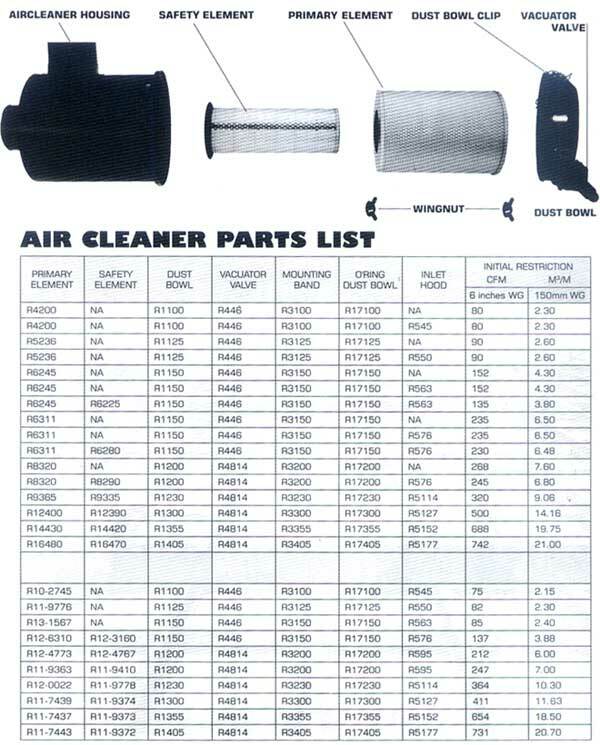 Cleaning restores element near new service life which reduces cost in air cleaner maintenance. The ROVOS ELEMENT eliminates problems of water in the air cleaner. Element vanes centrifuge mist and rain as well as dust... eliminates moisture plugging and freezing. The Vacuator Valve prevents water and dust build-up in dust bowl cup. To minimize servicing attention, the element is designed with just one critical seal which is fixed to the bottom end cap. When a new element is installed, the gasket is automatically replaces plus the inclusion of a new wingnut and gasket which ensures continued peak performance. - A safety filter element is positioned inside the primary filter element to protect the engine in case of damage to primary filter element. ROVOS air cleaners can be mounted horizontally or vertically, giving more flexibility for location. 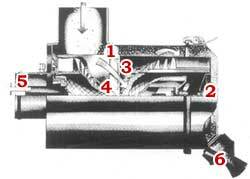 Ducting can be short and direct to the engine. Two mounting bands hold the ROVOS aircleaner to any rigid support. 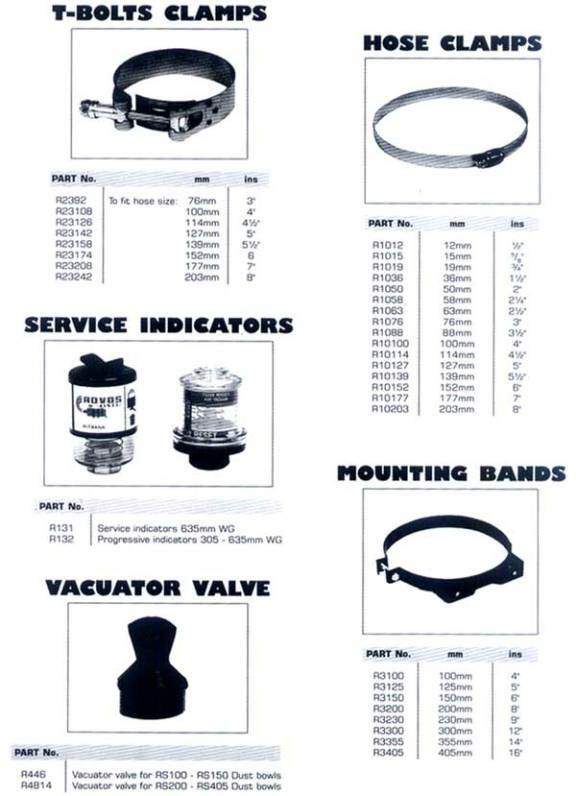 Complete installation kits are available for easy installation to most popular trucks, tractors, etc. Pre-Cleaner Fin Assembly - Angled vanes give cyclonic twist to entering air which spins out contaminants. Dust Bowl - Centrifuged contaminants are carried along the wall of the cleaner and collected in the dust bowl. 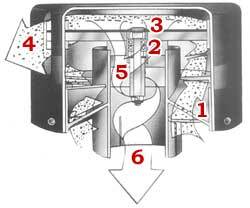 Primary Filter - Dust remaining in pre-cleaned air is removed by primary filter. Chemically stabilized filter media is pleated and embossed for a maximum surface area. Expanded metal shell protects inside and out, gives element rigidity and strength. 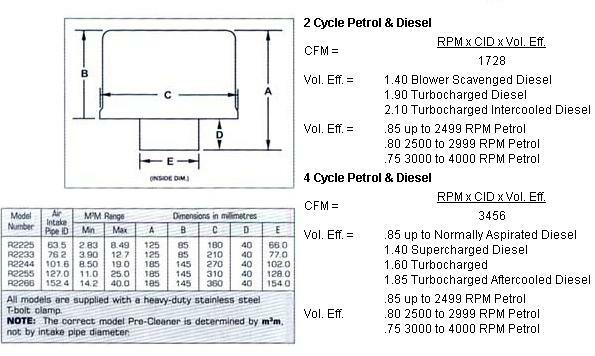 Safety Element - Air flows through both the primary and safety elements, In case of accidental perforation of primary element, the safety element protects the engine by blanking speedily and causing an air flow restriction which will be indicated by the restriction indicator, therefore warning the operator that there is an element failure. Clean Air Outlet - Duct is fitted with mounting fitting for restriction indicator. Vacuator Valve - Ejects dust and water continuously. Eliminates regular dust servicing and reduces downtime. Engine intake airflow power drives the unique Rospin Precleaner. The angle louvered plate direct the intake air flow to turn the stainless steel rotor. which is mounted on dual oversized heavy-duty bearings rated up to 5000RPM. This causes centrifugal force and intake compression around the inside perimeter of the epoxy coated steel hood to expel heavier air contaminants out through the discharge port. Clean dry air is drawn into the plenum chamber and then into the air cleaner. ROVOS Air Cleaners are guaranteed to be free from and defects in workmanship and materials during the service life recommended, and if found to be defective will be replaced. NOTE: Vehicle and engine warranties cannot be voided solely due to the use of ROVOS Air Cleaners. 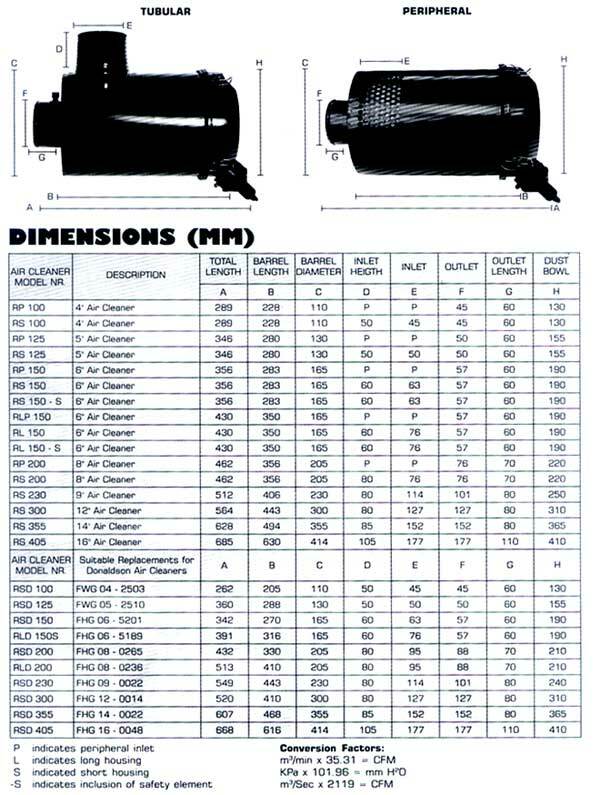 Primary air filters are design to filter 99.9% at 5um of AC fine test dust as determined by the Society of Automotive engineering Air Cleaner Test Code J. 726b.